Bruce White worked with semiconductors and transistors at Motorola and Texas Instruments. But when he left industry for a position on Binghamton University's faculty, the materials scientist decided to take his research in a new direction. "I didn't want to just continue to work on transistors and memory," White says. "I wanted to try to apply those tools to big problems that impact society." Energy is one of those big problems; in the United States, more than half of the energy we burn each year gets lost as heat instead of being put to use. "We do all this work to get oil out of the ground and to refine it, but when we try to do some work with it, most of the energy goes out the exhaust pipe of a car or out the smokestack of a power plant," White says. "Even if we could reclaim a small fraction of what we throw away as heat, that would have a significant impact on our energy use." There are ways to turn heat into electricity. If a material is hot on one side and cold on the other, the flow of heat from hot to cold can be turned into electricity. But most of the thermoelectric materials on the market today are not very good at doing that. The tricky part, White says, is getting the heat to flow through the material on the backs of electrons. In most materials, the heat flows in a wave that simply makes the material's atoms vibrate faster. That's not a useful phenomenon, and it ends up destroying the important hot-cold differential. In many materials, the vibration of atoms carries away 90 percent of the heat before it can be harnessed. White's goal is to create materials where the vibrational effects are minimized—or, in other words, where a larger percentage of the heat gets shuttled by electrons, creating a flow of electricity. He also thinks it's important to make sure those materials are abundant and nontoxic. White may have found a candidate in zinc oxide, a substance used in many brands of sunblock. Zinc oxide is abundant, cheap and safe, and it happens to be really good at moving electrons around. Unfortunately, in its normal state, zinc oxide has a molecular structure that transports heat by vibrating atoms instead of turning it into electricity. By manipulating zinc oxide at the molecular level, White and his colleagues are able to make it better at generating electricity. First, they stretch the material into wires that measure 50 nanometers across. (That's roughly 10,000 times thinner than a human hair.) That incredible thinness changes the way heat spreads through the material. Next, they embed the nanowires in a silica aerogel, a substance that's terrible at conducting heat. Because of the interesting and unique interactions that occur at very small scales, nanowires can take on the properties of surrounding materials. In this case, the wires became very poor heat conductors. Their ability to conduct heat through atomic vibrations decreased by a factor of 10, so their efficiency in turning heat to electricity shot up. The results were published in April 2013 in Applied Physics Letters, the top journal in the field. What's particularly exciting about this discovery, White says, is that the materials of the wires and the aerogel can be mixed and matched to customize the thermoelectric properties for different applications—such as harnessing waste heat from a power plant, car or household furnace. Since aerogels are nearly transparent, White even envisions making window coatings that exploit indoor versus outdoor temperature differences to generate electricity. With the right materials, it may be possible to eliminate the internal combustion engine altogether. White and his lab members think they may have a way of doing that. It all comes down to silicon, which is an excellent semiconductor—that's why our electronic devices are silicon-based—but is also really good at conducting heat via atomic vibrations. White's group is getting rid of those vibrations by building a silicon-tin composite using a new fabrication technique that grows the material layer by layer. The work caught the attention of the Naval Research Office, which provides funding for White's research. 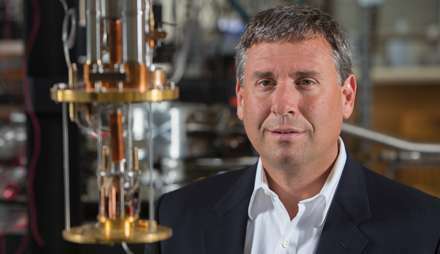 "It's his fabrication method that really makes it different," says Robert Walters, head of the Naval Research Laboratory's Solid State Devices Branch. "Bruce has developed the fabrication technique that we feel will actually achieve the layered silicon-tin structure, which we think we really need to have to de-couple silicon's thermal and electrical properties. … It's a very good idea. It's innovative and it's different from other things that we've seen." The new composite material has a thermal conductivity that's 1,000 times lower than regular silicon. The group hopes to make it three times lower still by making the crystal purer and more evenly patterned. If the thermal conductivity gets that low, the material would be so good at turning heat into electricity that it could power a car with the burning of a flame. That's far off in the future, though. As they work on refining the materials they've already developed, White's group is on the brink of creating less extreme materials that could still have a big impact. Heat-harnessing materials, which could be retrofitted onto a car's tailpipe or radiator, could soon generate enough electricity to power the car's electronics. "That alone could increase the fuel efficiency by a few miles per gallon," White says. "When you think about integrating it over the entire automotive fleet, that makes a huge difference." There is no doubt that waste heat is huge resource and an economical device to capture it be a huge advance. If most of the heat from a fission core could be turned into electricity then one of its largest problems (access to reliable cooling) would be mostly mitigated. Cooling towers would be seen as wasteful. A small amount of water could be continually recycled in the outer heating loop instead of constantly requiring fresh water. This is amazing. Dr. White is my professor right now. It's just a complete coincidence that I went on here and saw an article about him. He was wearing that white button down shirt in class yesterday and I thought, "I wonder what he's getting dressed up for." jizby, that's a decent point to bring up. Decentralized grids do make a lot of sense for things like commercial and residential demand...but not so much for factories or even cities. As the article states, this is also good news for waste heat in automobiles too. Imagine plug-in hybrids that can recharge 3x faster off its engine. Or serial hybrids that just use a heat source (**simplicity**) for supplemental current. Since a device like this requires a thermal differential to operate I wonder what the maximum theoretical efficiency could be. Is it greater than 50%? Labs on the Banks of Volcanoes should be far more IDEAL! Rather than scraping left overs....Go for the Great DINNER! Good point. Hopefully some grid-level energy storage could smooth those cycles out significantly in a decade or so.